Port Maje Harbor Map of location in Pillars of Eternity II: Deadfire Video Game. 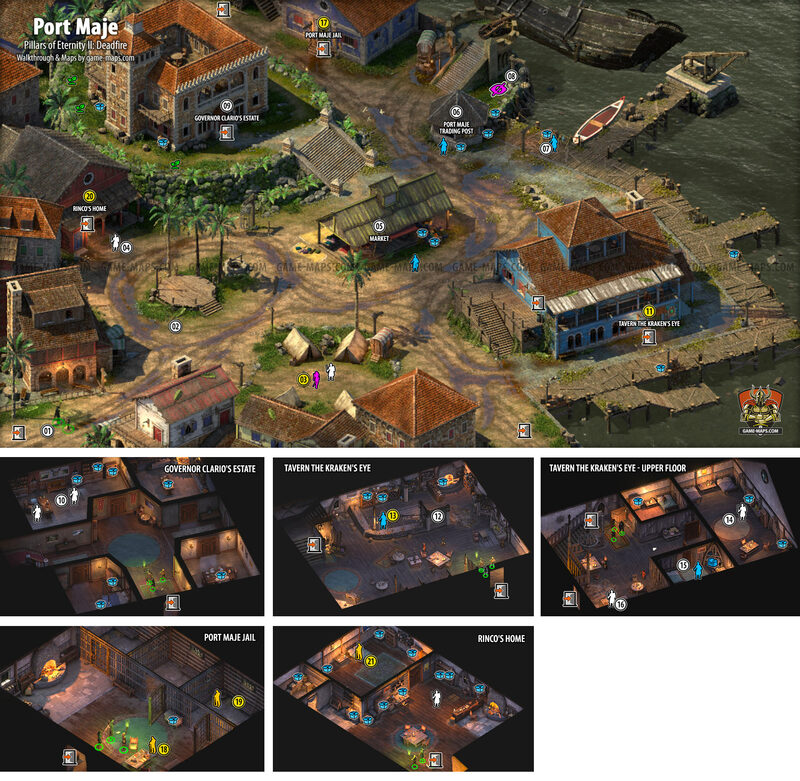 Port Maje Harbor Map for Pillars of Eternity II: Deadfire. Port Maje, Governor Clario's Estate, The Kraken's Eye, Port Maje Jail, Rinco's Home. The man at the center of attention appears to be fielding inquiries from both the gaggle of townsfolk gathered around the platform and a rather severe-looking aumaua woman standing just beside him. 03Children of the Dawnstars Camp. Join Xoti to your party. Xoti is chasing Eothas throughout the Deadfire while striving to fulfill her purpose to Gaun. Apparently a wayward Child of the Dawnstars, she's asked me to help her shepherd the souls of the dead. But her duty may come with a price. Assist Xoti's efforts to shepherd lost souls throughout the Deadfire. Speak with Xoti regarding her prophetic nightmares. Perform a spiritual cleansing in the Temple of Gaun. Speak with Xoti about her worsening nightmares. Take Xoti to a luminous adra pillar. Take Xoti to the animancers in Neketaka. Travel with Xoti post cleansing. Trusting the gods to see to their rebirth, Xoti shepherded the souls she'd harvested into a luminous adra pillar. To aid the development of an artificial rebirthing process, Xoti trusted her harvested souls to the animancers. Xoti chose to absorb the lantern's soul-harvest. Edér is interested in reconnecting with a woman he used to know who supposedly settled in Deadfire with the Children of the Dawnstars. Find someone who might know Edér's friend. Look for Elafa in Hasongo. Investigate the Partisans of the Lighted Path. Get to the "vanguard" ship. Pursue the Lighted Path ship. We were able to convince Bearn not to drink the poison that the other members of his sect took. He's survived the ordeal, though he doesn't appear to be convinced it was for the best. Bearn consumed poison in front of us, but we were fortunately able to resuscitate him. He's survived the ordeal, though he doesn't appear to be convinced it was for the best. We were unable to stop Bearn from taking his own life with the rest of the members of the Partisans of the Lighted Path. Someone critical to the completion of this quest has been killed. Documents Ogne was carrying seem to suggest that the Partisans of the Lighted Path might intend to join Eothas by dying in close proximity to him. Bearn said he intended to be in their vanguard - the first wave to join Eothas. Their ship was most recently docked in Neketaka. We have to get there before it departs. Weapons and Armors, you can also retrain your character here. Strange Tablet This stone tablet is wrapped in a rich leather and engraved with a flowing vertical script in a language you've never seen before. Buy Strange Tablet, you will need it later (for Rekke). [Stranded] and [To Hunt a God] updated. The governor of Port Maje mentioned that several witnesses claim to have seen a 'giant' moving eastward toward a digsite spearheaded by the Vailian Trading Company's animancers. It's worth a look. Governor Clario gave me directions to the digsite, on the eastern side of the island. You can steal books if you want. You can Recruit customizable Party Member, retrain character and rest here. Room will be available after you finish quest for Thorel. With working ship, you can recruit crews here. With a host of traders left stranded at Port Maje by the storm's destruction, there are no vacancies at the local tavern. However, Thorel, the tavernkeeper, is willing to put me up - if I clear out one of the current occupants. I convinced the roustabouts to be on their way, and the tavernkeeper agreed to let me stay in the inn at a discount. Having somewhere to rest while I'm in town ought to come in handy. Thorel wasn't exactly thrilled by my methods, but I convinced him to let me make use of the room I cleared out. Having somewhere to rest while I'm in Port Maje ought to come in handy. I decided to deal with Galian and his crew more directly. The innkeeper didn't appreciate it as much as I'd hoped. Thorel identified the lead culprit as Galian, a merchant captain. I'll find him and his crew upstairs, in the room furthest to the back. Make him peacefully or brutally to leave the room. Return to Thorel for reward. I've offered to help Savia by trying to convince Ilari, a gang leader, to help keep order on Gorecci Street in Port Maje. I was attacked by several looters, but none of them matched Ilari's description. I attacked Ilari, making a peaceful resolution to the Gorecci Street problem impossible. I handled the Gorecci Street situation for Savia. It's one less thing for her guards to deal with. Travel to Gorecci Street, located in the western part of Port Maje. Rum-Dumb Riggere, a sailor imprisoned in Port Maje's jail, has offered to join my ship's crew if I free him. Meet up with Rum-Dumb Riggere. Riggere said that Commander Savia will free him if his fine is paid. Unfortunately, he's racked up a fine of 400 pires. I paid Rum-Dumb Riggere's fine and gave him his freedom. I broke Rum-Dumb Riggere out of jail. I used an explosive to destroy the bars on Riggere's jail cell window. He made his escape in the resulting chaos. I killed Savia and broke Rum-Dumb Rigger out of jail. Tensions are running high between the Huana tribe and the Vailian settlers of Port Maje in the wake of the storm. One of the Vailians claims to have been violently accosted by a Huana warrior. Rinco, one of the vendors at the local market, claims to have been having a friendly round of cards at the tavern when he got into a fight with Mokeha, a high-ranking Huana villager. He came out of that fight the clear loser. Bedridden, Rinco's asked me to retrieve the money Mokeha stole, in exchange for a portion of the winnings. I took care of Mokeha and returned Rinco's property. It took some persuading, but I managed to get Mokeha to see reason. She and Rinco will never be fast friends, but this should at least keep things from souring further between the Vailians and the Huana. I decided to let Mokeha keep the money. Rinco won't be pleased, but it's not as if he can do anything about it. I decided not to trouble myself with Rinco's problems, and took his money for myself. I convinced Rinco to leave Mokeha alone. He's not happy about it, but at least this won't escalate any further. Rinco suggested I could find Mokeha in the Huana village to the northwest of Port Maje. Give Oderisi's Notes to Clario. All your comments, suggestions and corrections are very welcome. Your experience helps other players. We invite you to add comments, thank you. All trademarks are the property of their respective owners. Do not copy or reprint any element of this site.